PhytoCellTec Argan Stem Cells support skin’s tone and connective matrix, collagen and elastin, protecting and energising for a more lifted, firmer, smoother looking appearance. .
Andalou Naturals believe that beauty is a choice; it’s about how you think, feel and behave. This true for individuals and companies. Andalou want to create products that are in accordance with who they are and CHAMPION their beliefs. Use in the morning and evening. Apply to damp skin, gently massage, and rinse clean. Use in the morning and evening. After cleansing, saturate cotton pad and gently sweep over face and neck. Use at night. Apply to clean face and neck. 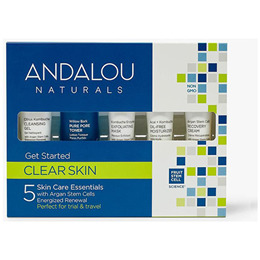 Below are reviews of Andalou Get Started Clear Skin Kit by bodykind customers. If you have tried this product we'd love to hear what you think so please leave a review. PhytoCellTec Argan Stem Cells support skin’s tone and connective matrix, collagen and elastin, protecting and energising for a more lifted, firmer, smoother looking appearance.